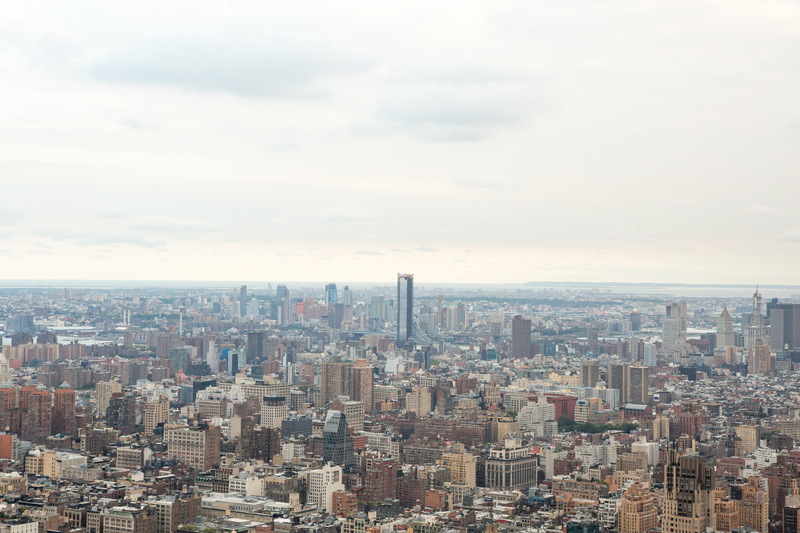 The scale of Manhattan West would, in any other neighborhood or city, be revolutionary. 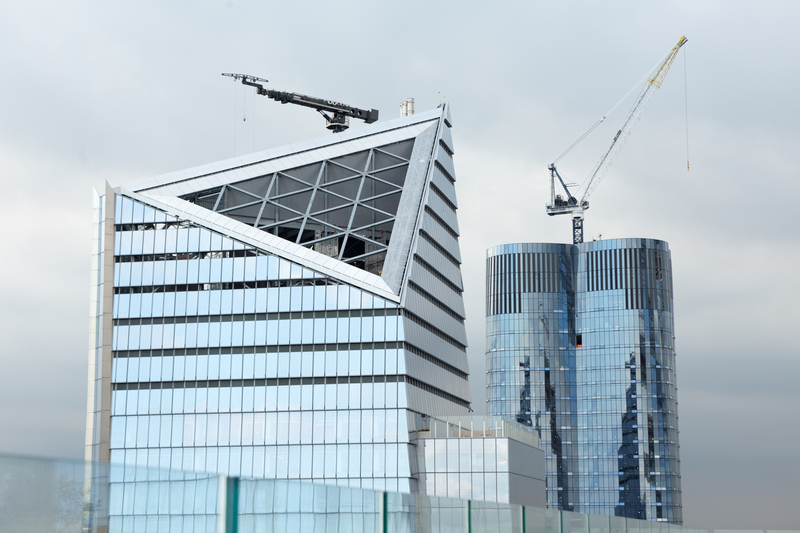 However, the project is literally across the street from Hudson Yards, the highly anticipated $25 billion project led by Related Companies and Oxford Properties Groups. It is the large largest private development in US History, and once complete it will yield over half the land area of Central Park, at 18 million square feet. 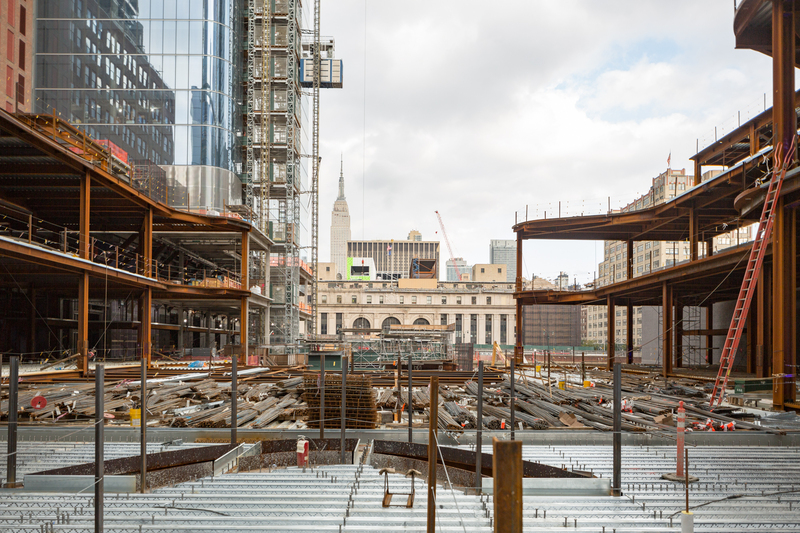 While Hudson Yards has been a public spectacle, Brookfield has been remarkably successful in delivering as well. 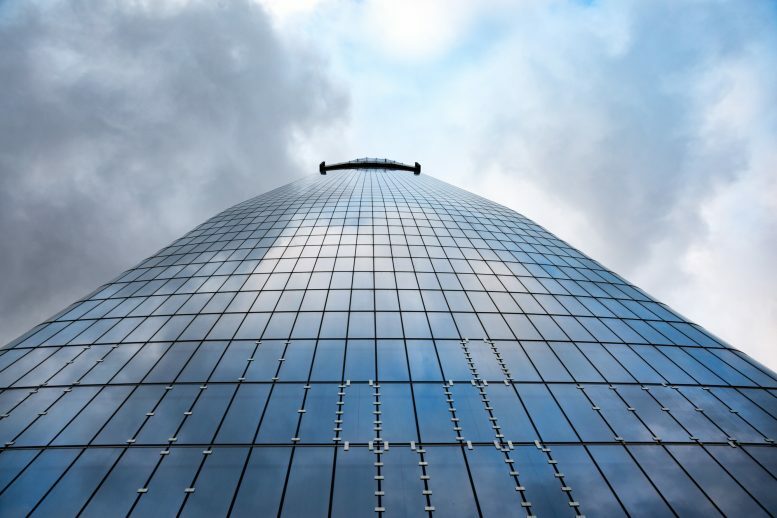 90% of OMW has now been leased, with Ernst & Young claiming the largest stake of 640,000 square feet. 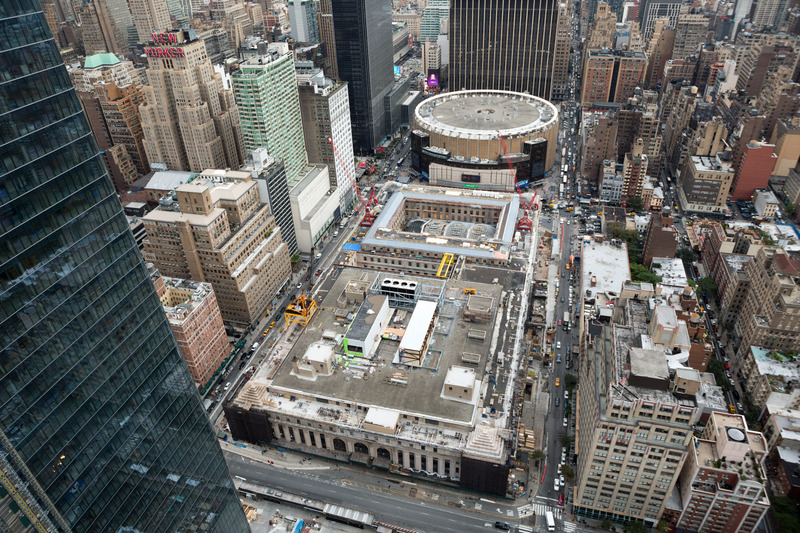 New York-based law firm Skadden Arps will be taking 550,000 square feet, and the NHL another 175,000 square feet. Accenture, which leased 250,000 square feet, will be occupying the floors where YIMBY toured last week. 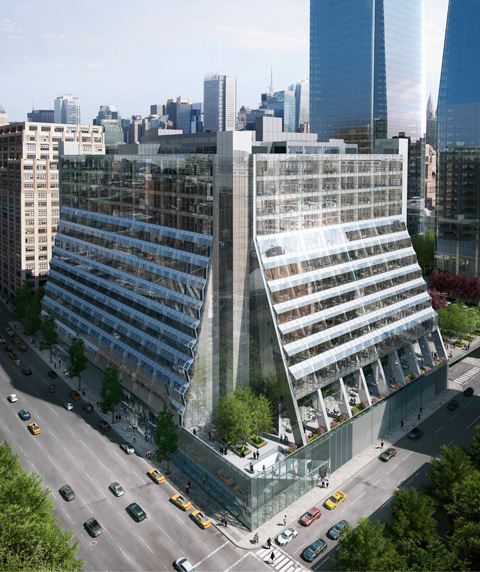 Five Manhattan West has already opened a sizable amount of office space, including Amazon’s 360,000 square foot occupancy. The NHL Headquarters will soon occupy another 160,000 square feet, which will also be accompanied by a 15,000 square foot retail superstore. Along with a new Whole Foods, a Peloton fitness center will be opening up as soon as the central courtyard is complete. 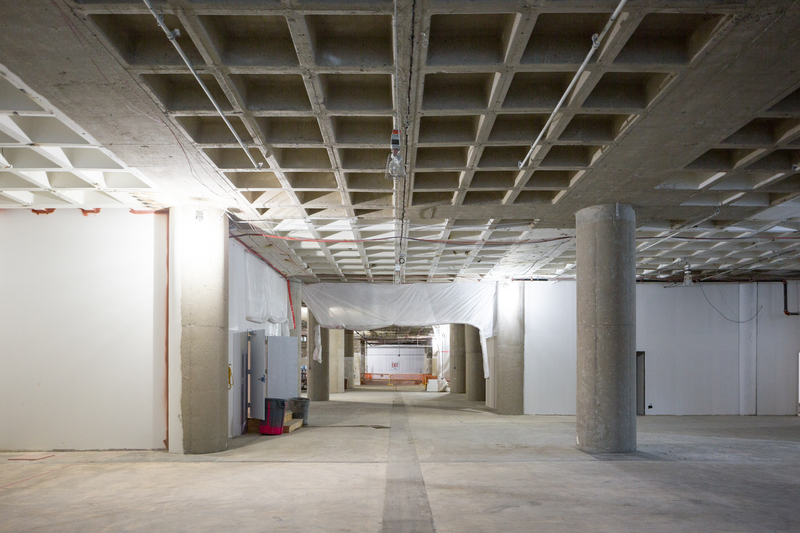 The 32,000 square foot leasing has included a studio, retail front, and offices. The deal won JLL and Newmark Knight Frank a REBNY “Most Ingenious Retail Deal of the Year” award. Manhattan West will also soon yield a two-acre public park designed by James Corner Field Operations, famed for the nearby High Line Park. The shops take inspiration from the success of Chelsea Market, and hope to create an equally engaging space with a mix of food, retail, and pop-ups. The central courtyard sits on a platform above a large parking garage and active railway tracks. It will open up a quarter million square feet of retail. 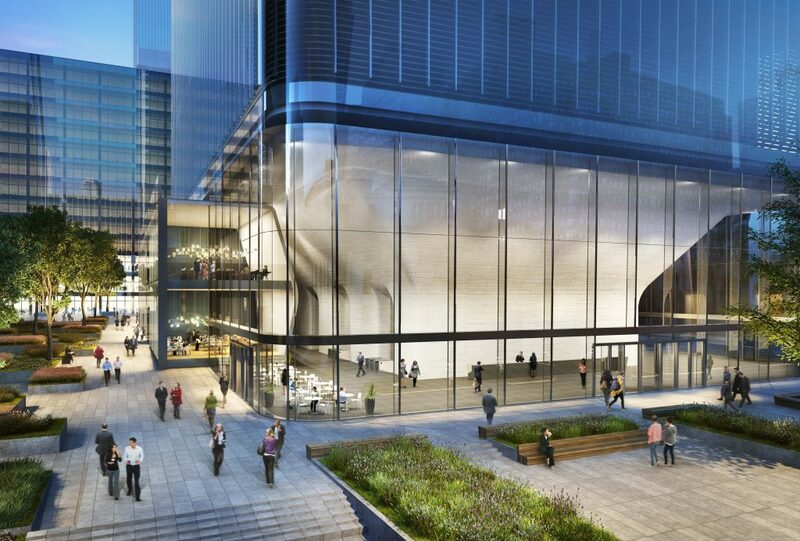 Pendry Hotels will take charge of the hotel space in 4 Manhattan West. The California-based company will manage the 164 guest rooms, along with a restaurant, terrace bar, and event space. Groundbreaking is expected to start later this year, and completion is expected by 2021. 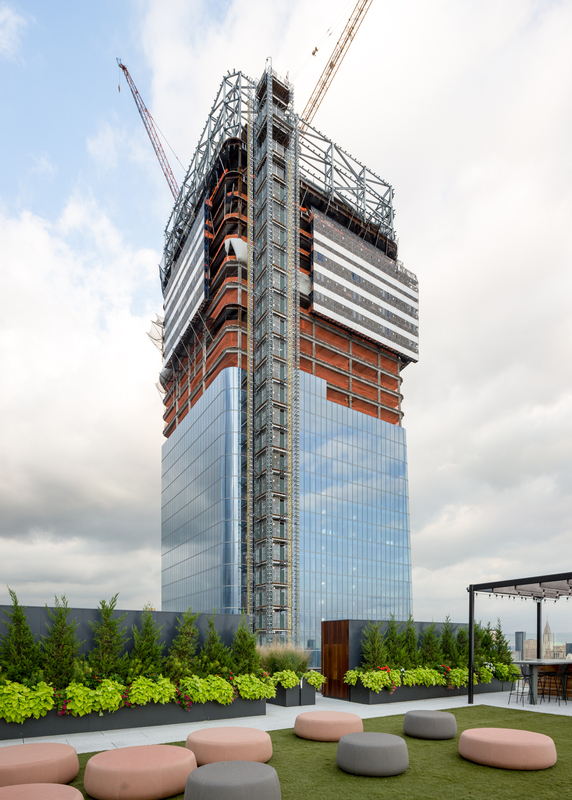 The first completed building was the Eugene at 3 Manhattan West, opened last year. 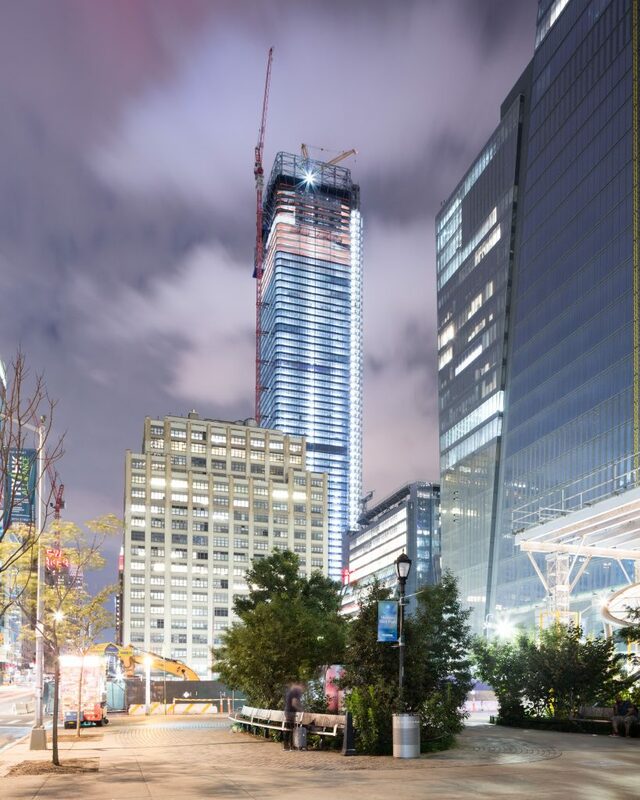 The 730-foot tall structure has 844 new apartments. 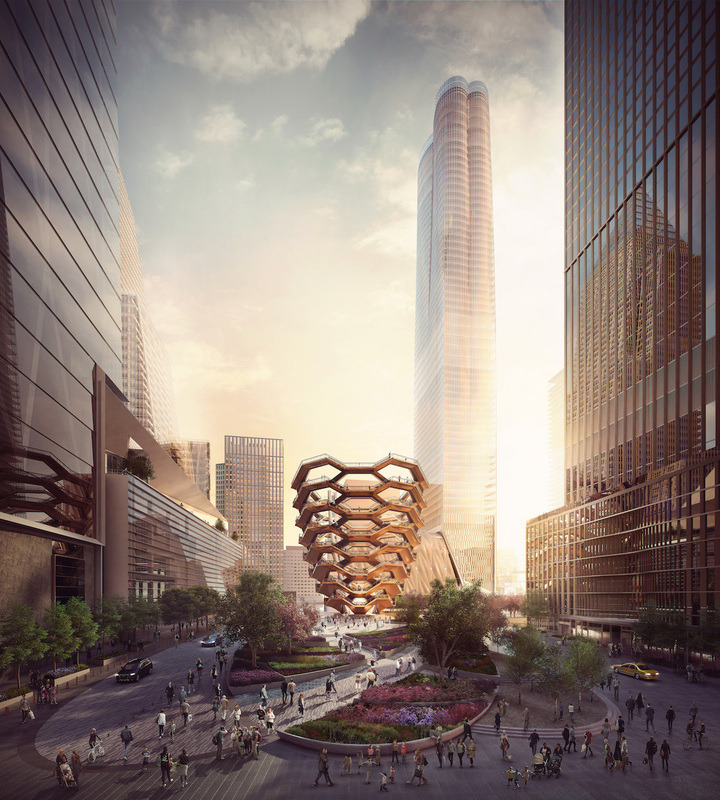 Once OMW is complete, the 995-foot tall structure will yield 2.1 million square feet. Skidmore, Owings, and Merrill is responsible for the design. At the building’s base, installation of the stone lobby space and 45-foot tall curtain wall is progressing. The entrance is designed to reflect the idealism of transparency respected in corporate branding. The façade has reached ten floors below the top floor, marking a seven floor-increase since we last covered the project just over a month ago. While closing up the final few floors of the façade for towers is often prolonged, we can still learn from the visual proximity to completion about how the tower will fit into the surrounding neighborhood. 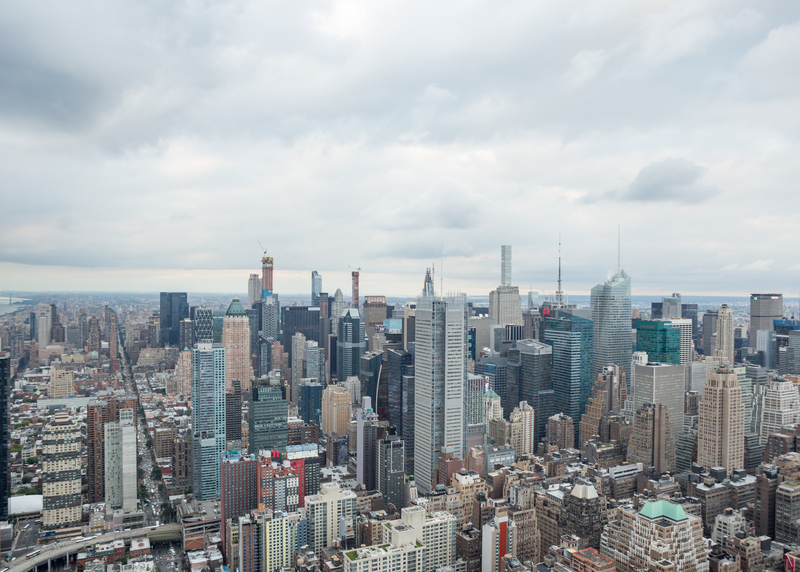 Though Hudson Yards prevents a clear view of the river, the Midtown sights are unmatched, with the New York Times building by Renzo Piano near Times Square being the closest comparable skyscraper, over half a mile away. Central Park Tower, 111 West 57th Street, and 53 West 53rd Street all stand out along the skyline. Looking toward Brooklyn, Extell’s One Manhattan Square and the orange construction fence netting of Brooklyn Point structures stick out. From the top of OMW, it’s clear that progress is also moving forward on the Empire Station Complex. OMW is expected to open next year. 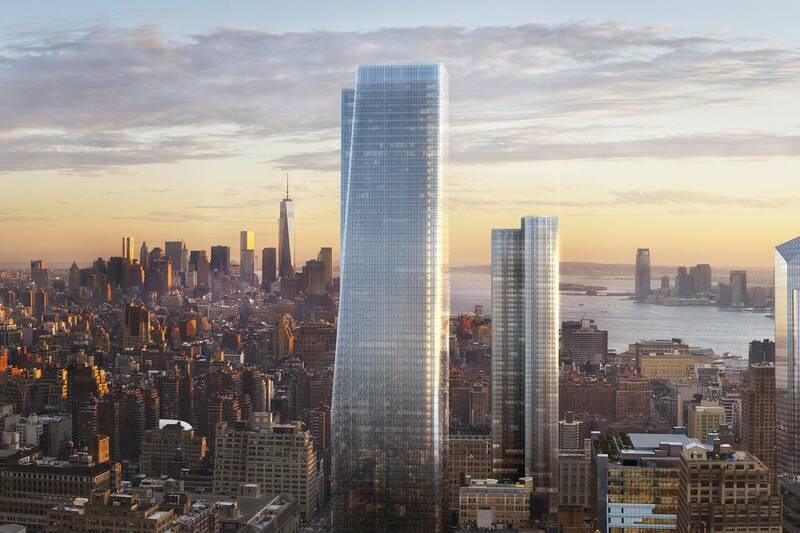 Two Manhattan West is expected to open by 2022. 8 Comments on "YIMBY Tours Brookfield’s Manhattan West Development, First Look at Rooftop Views"
The only person that would pardon you is Trump. Amazing to see the development of the area. Kudos to Brookfield for pioneering the effort and enhancing the hottest area in our city! Spectacular pictures. Seeing the progress on the station is heartening. 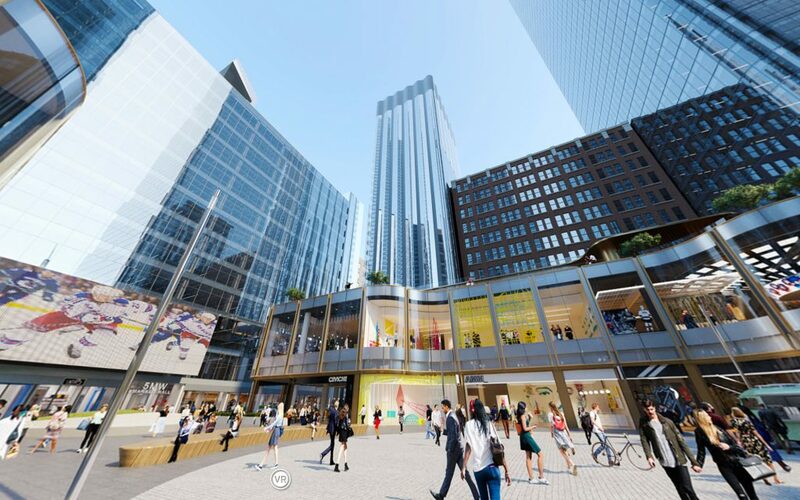 A truly walkable corridor from Herald Square to the Hudson is taking shape. Glass is glazed in the curtainwall contractor Benson assembly facility The metal in the photo are temporary clips while the silicone cures for some glass lites that had to be replaced in the field. Once the 28 day curing cycle is complete the clips are removed. Does anyone know the opening date of the Whole Foods? I´m sorry, but these views from the air show a conundrum of a city.